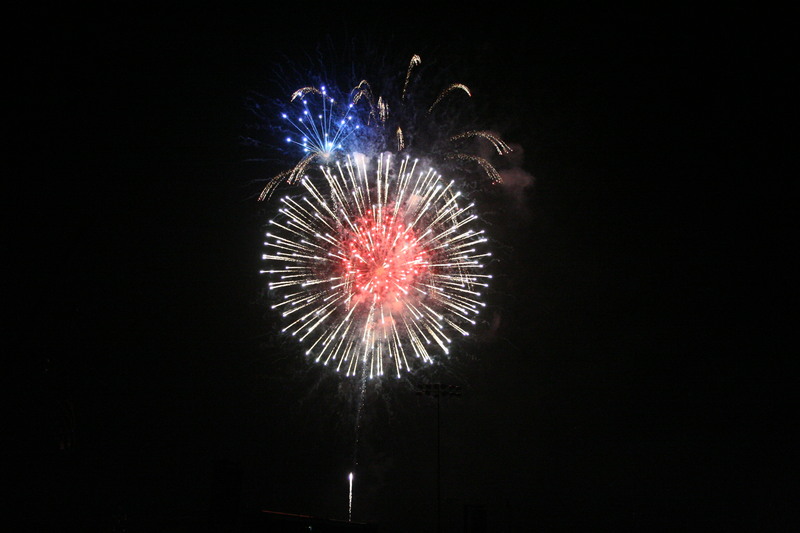 The annual Santee Salutes July 4th celebration moves to a new home for 2012, but look for the same great family-friendly fun and marvelous fireworks. This year the event will take place at Town Center Community Park East, site of the weekly Summer Concert Series (which takes this week off for the Fourth). The fun officially begins at 3:30 p.m. and lasts until 9:30 p.m. following the evening’s fireworks show. Families looking for the best spot will probably want to arrive early to save the space. This year a long-time favorite, 80z All Stars, will return to provide the musical entertainment. 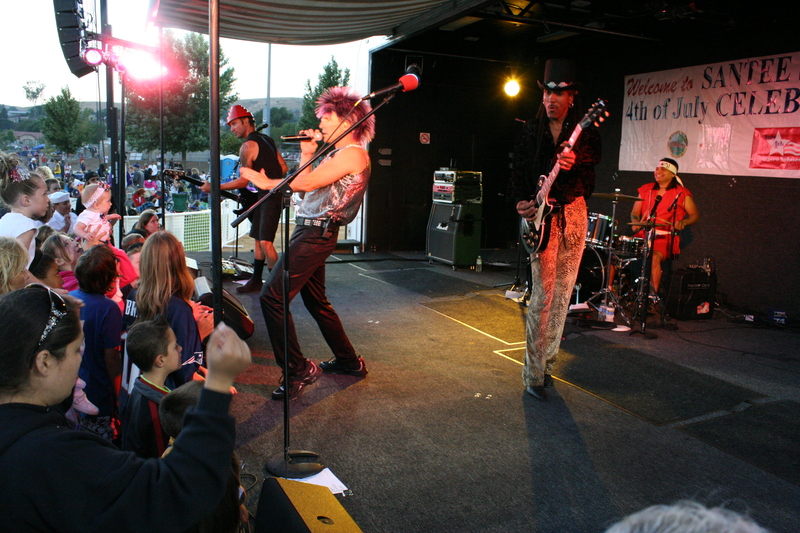 The 80z All Stars have performed at previous Santee Salutes celebrations, the Summer Concert Series and the Santee Street Fair. The day will also include carnival games and inflatables for the kids (and those young at heart) and traditional food booths. New this year will be a lineup of gourmet food trucks offering everything from old-fashioned barbecue to spicy Thai delicacies. 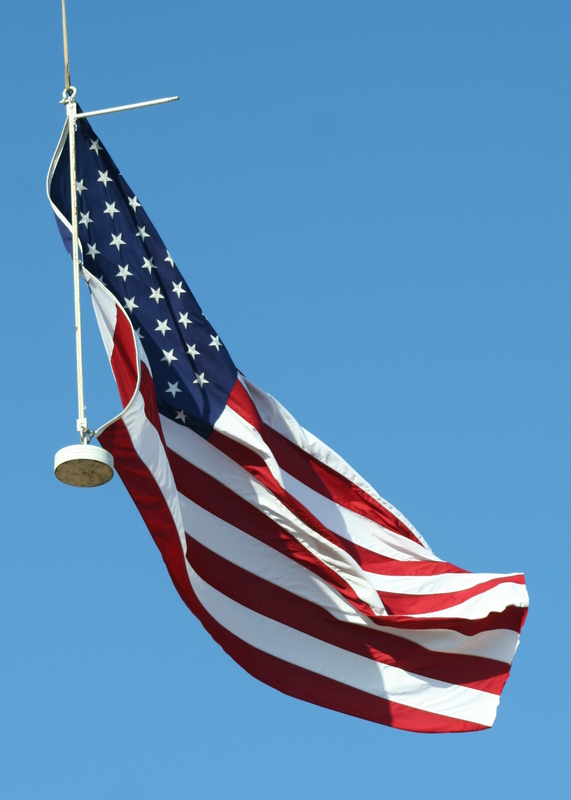 For those who like to cool down during the day, the City of Santee Aquatics Center will offer free swimming from 1:00 p.m. to 3:00 p.m.
At 6:00 p.m. a patriotic ceremony will celebrate the true meaning of the Fourth of July. The ceremony will feature speakers and a color guard from the Heavy Helicopter Squadron 462 (the “Heavy Haulers”) from Marine Corps Air Station, Miramar. The fireworks show begins at 9:00 p.m. This year, to help defray some of the costs of the free event, the city will be charging a $5 fee for parking in surrounding lots, with limited preferred parking in the closest lot for $15. Handicapped parking in the preferred lot will be $5. There will be free parking with a shuttle at the Costco parking lot, beginning at 3:00 p.m. and lasting until 10:00 p.m. RV parking is also available in the Costco lot. Another new addition is the ability to reserve a 10×10 canopy in a prime location for $100. This will allow you to enjoy the day and not have to worry about carrying chairs, tables, coolers and what-have-you a long distance from the parking lot. The fee includes preferred parking and spaces can be reserved online at www.ci.santee.ca.us. Several area streets will have traffic limited to residents during the evening hours because of the celebration and fireworks. Bilteer Drive, Bilteer Court, San Remo Court, San Remo Drive, Conejo Place, Magnolia Park Drive, Cottonwood Avenue, Verde Vista Lane, Day Creek trail and Leavesly Trail will be closed except to residents. Santee Salutes is presented by the City of Santee, with sponsorship from Waste Management and Cannon Pacific and donations from Lakeside Equipment Sales Inc, Bob’s Crane Service, Cottonwood Electric Cart Service and Rice RV. For more information, visit www.ci.santee.ca.us or call the Special Event Hotline at 619-258-4100 ext. 201. On Monday Santee once again salutes our Nation’s independence with the annual Santee Salutes July 4th celebration. The event, which takes place at Town Center Community Park West, begins at 3:30 p.m. and lasts until 9:30 p.m. and includes music, games, and fireworks. Several local restaurants and groups will have booths set up with a variety of foods and treats. A special ceremony will include a color guard from one of Santee’s adopted Marine units. The fun begins with music by the Danielle Tucker Band from 3:30-6:00 p.m. playing contemporary country tunes. A Kid’s Zone will feature carnival rides, inflatables, and games for the young revelers at minimal cost. The nearby Aquatic Center facility will be closed for the day, but the pool will be open from 1:00-3:00 p.m. for a little relief from the expected high temperatures. The ceremony honoring Independence Day begins at 6:00 p.m. and will include the color guard and patriotic songs by young singers from Singing Solo. After the ceremony the Mighty Untouchables take the stage with music ranging from Motown to contemporary Top 40 Hits. The celebration ends with a fireworks display beginning at 9:00 p.m. Food will be available until the end of the day and will include offerings from Michael’s Grill, Pat and Oscars, Eccentric International Chefs and Bakery, and Elegant Buffet. Organizations on hand with food will include SPARC (Santee Parks and Recreation Committee), Santee Ravens Football and Cheer, and the Teen Center. If you plan to attend, be aware that blankets and coolers are welcome, and shades are allowed in certain areas until the fireworks begin. However, glass containers and barbecues are not allowed and pets must be on a leash at all times. Also be aware that parking on site is severely limited and it is recommended that you use one of the off-site locations, either the Costco parking lot or the Cameron Family YMCA, or the Edgmoor Hospital site for limited RV parking. There will be shuttle service between the outlying lots and the event. For more details, visit the Santee Salutes July 4th page on the City of Santee website. 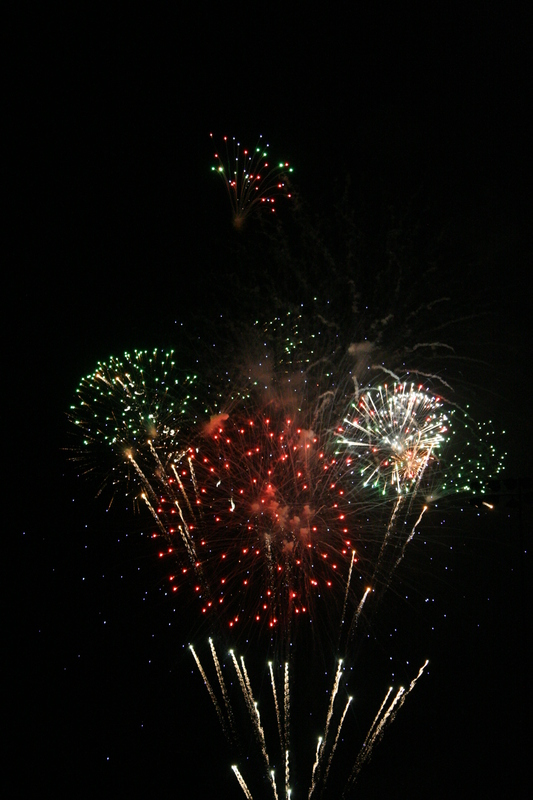 The Fourth of July has come and gone, and once again Santee had one of the best celebrations around the county. This year we not only had music, food, and fireworks, we had sunshine, which much of the county missed out of because of the lingering June Gloom. Even better, the sun was a friendly glow in the sky, not the blazing inferno we often have on the Fourth of July. 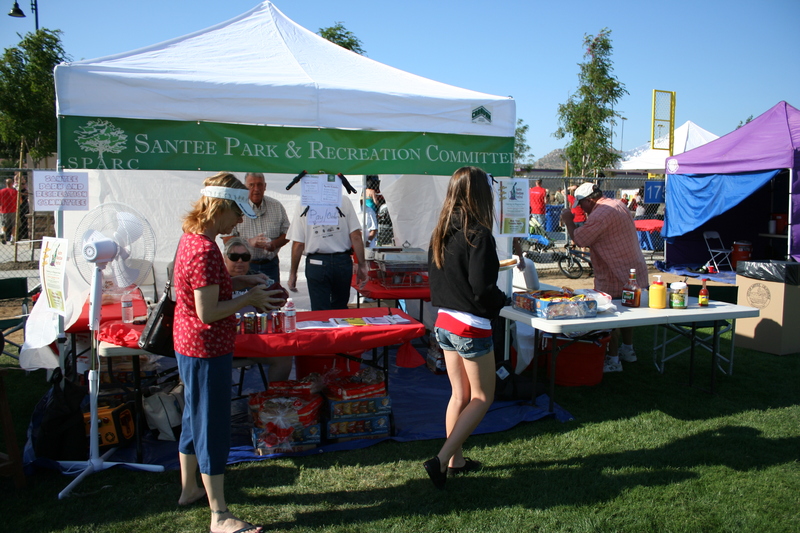 Add in all the other amenities and it’s no wonder so many people enjoyed the 2010 Santee Salutes July 4th Celebration. In fact, about the only negative about the day was the need for more restrooms. Although the city did bring in portables, there probably should have been more on the main field, where there was frequently a line of a dozen or more waiting for one of the three at each station. The celebration was also the first opportunity for many Santee residents to see the improvements and new developments at the Town Square Community Park. 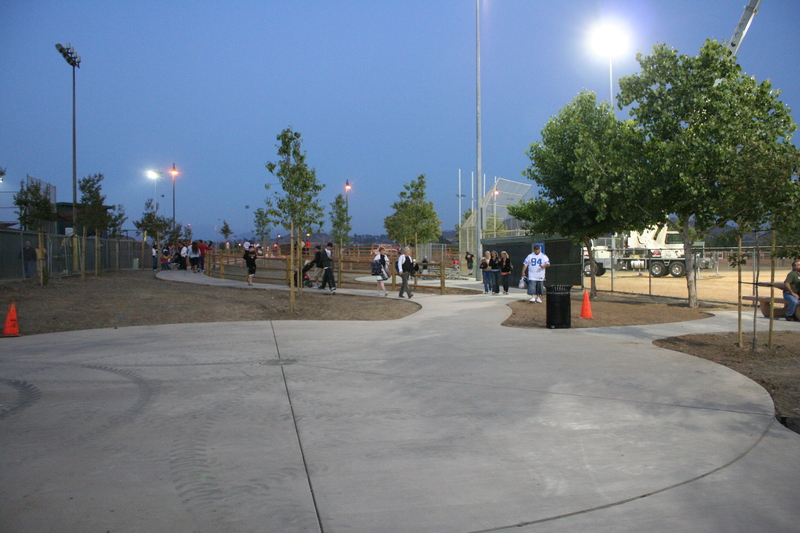 A little more than a month ago the Town Center Community Park/SportsplexUSA complex celebrated its grand opening, and although the Santee Salutes festivities were taking place on the existing fields to the west, there has been quite a bit of work connecting the two areas. This includes an extension of River Park Drive past Cuyamaca Street to a new parking lot between Rio Seco School and the SportsplexUSA facilities and a walkway from the parking lot to the ball fields. Once all of the work is completed this will be Santee’s largest and most versatile community park. As usual, there were many activities to choose from during the day. Championship Gymnastics and Cheer put on a demonstration by some of their students in front of the main stage. Several businesses had booths on the main field, including Pina Business Services and Simply Spa, which was offering free chair massages. Alas, Pina Business Services did not offer to massage your books there. 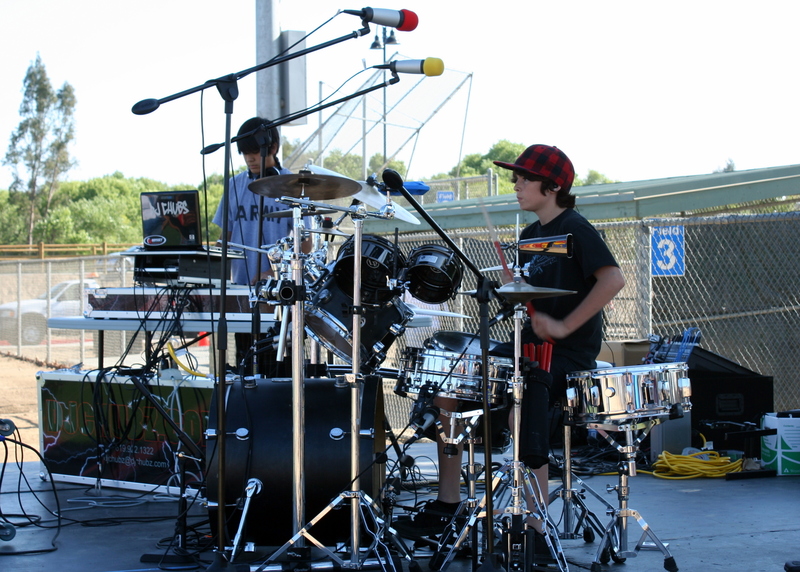 On an adjoining field the Santee Mobile Recreation team had set up several games for younger kids and a stage with DJ Chubz and a young drummer who simply wowed the crowd. Fourteen-year-old Christian, who has only been playing for three years, showed that age has nothing to do with talent and ability as he drummed along with music played by the DJ. Also on the game and music field was a much more sobering display – the SUV that had been struck by an intoxicated driver at the intersection of SR-125 and Mission Gorge Road earlier this year. On a third field were several inflatables, a laser tag area, and some carnival rides. All of these were busy throughout the afternoon. The fourth field was easily the most popular – the food booth field. Here you had a choice among traditional Fourth of July hot dogs from SPARC (Santee Parks and Recreation Committee), chicken satay from Michael’s Grill, smoothies from Smoothie King, desserts from the Eccentric International Chefs, and much more. Still, with all of the variety of food to choose from, the longest line for most of the day was for kettle corn. Santee always puts its patriotism on display on the Fourth of July. This year’s opening ceremony included a color guard provided by one of the city’s adopted Marine units, HMH-462, the “Heavy Haulers” from MCAS Miramar. On the stage were representatives from both units as well as Mayor Randy Voepel, City Councilmen Brian Jones and John Minto, Miss Santee, Kimberly Swank, and Miss Teen Santee, Taylor Shelton. Singing Solo provided Imagine Truelove, who sang “God Bless America,” and Kelsie Martin, who sang the National Anthem. Once again music was provided by 80z All Stars, and their alter-ego, Just Push Play. This year lead singer Nigel Naughty, bassist Devo 2.0, and drummer Karate Kid welcomed newcomer and lead guitarist Jamie Star. The change in band member seemed to make no difference to the crowd, who rocked and danced the afternoon and night away. The night concluded with fireworks that lived up to everything Santee has come to expect. Thanks go out to Waste Management for their sponsorship of the celebration and to community partners Pinnacle Peak Steakhouse, Cannon Pacific, Rice RV, Bay City Electrical, and Bob’s Crane Service. 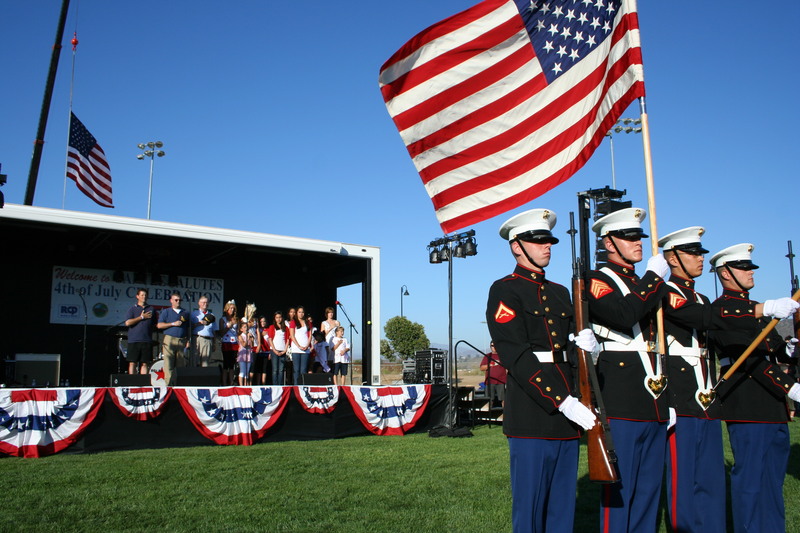 It’s time again for the annual Santee Salutes July 4th celebration at the Town Center Community Park West ball fields. Every year this is a major event with music, games, food, and, of course, fireworks. The festivities are sponsored by the City of Santee and Waste Management, Inc., and run from 3:30-9:30 pm. The celebration will include a Kids’ Fun Zone with inflatables and games and the City of Santee Mobile Recreation area with free activities and music by DJ Chubz. 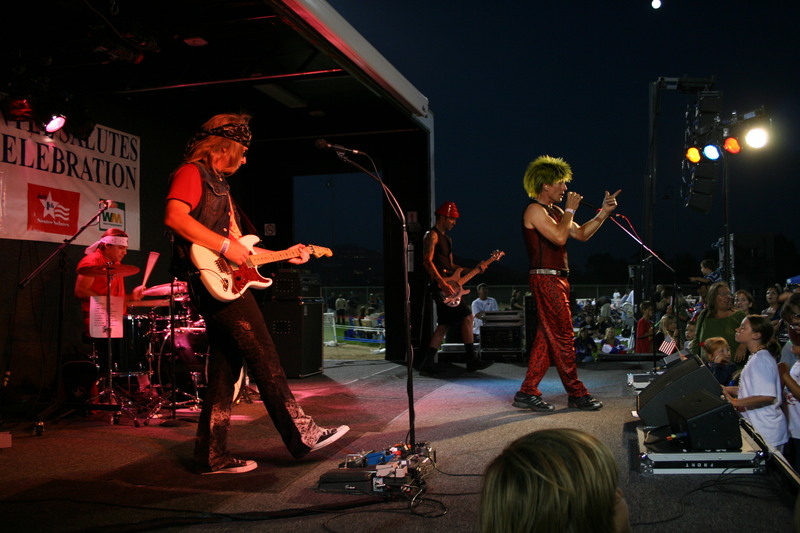 There will also be live music by the 80z All Stars, a perennial favorite in Santee. The city cautions that parking in the area is limited, so to help alleviate traffic there will be off-site parking for cars at the Costco and Cameron Family YMCA parking lots and limited RV parking at the new Edgemoor Hospital on Park Center Drive just off Mast Blvd. There will be regular shuttle runs from each of these lots to Rio Seco School, next to the fields. There will also be traffic control in the area with resident-only travel on Bilteer Drive, Bilteer Court, San Remo Drive, Conejo Place, Magnolia Park Drive, Verde Vista Lane, Day Creek Trail, and Leavesly Trail. In addition, Cuyamaca Street will be closed to all traffic between 8:00 and 10:00 pm. Enjoy a day filled with fun, and please remember to leave the fireworks to the experts. 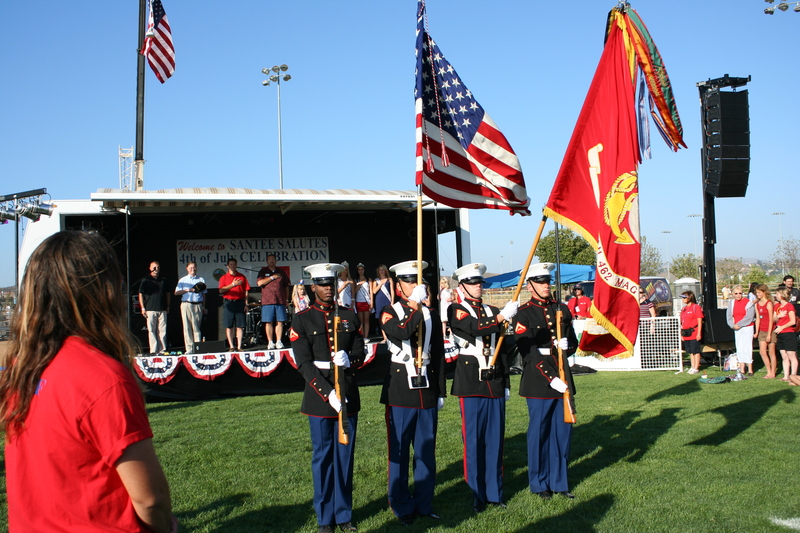 Santee Salutes July 4th, 2009, included the presentation of colors by the U.S. Marine Corps. For more on last year’s event, see Santee Salutes July 4th in a Big Way. Well, 2009 is now over, but the year in review is only halfway finished. In Part 1 I managed to get from January through April, but Part 2 was only able to cover May and June. This was partly due to the number of stories and partly due to the time I had to work on Part 2. And now, without further ado, we move to July and the start of Part 3. I started off July with a short update on the off-leash dog parks, and previews of the Santee Salutes July 4th celebration, the first Santee Summer Concert of the month, and the Movies by the Lakes schedule. I also wrote about a VIP party held at the end of June at Café 67 – which is a member of the Santee Chamber of Commerce, even though it is located in Lakeside. Café 67 is a great place with great food and deserves a try for breakfast or lunch. Of course, the big event every July is the Santee Salutes July 4th celebration. This year the event, which always takes place at the Town Center sports fields beside Rio Seco School, featured games and rides for kids, a large food area, music by the 80z All Stars (and their alter-ego, Bootylicious), and a huge fireworks display. The keynote speaker, guest of honor, and honorary mayor for the day was Lt. Colonel Ronnie Carson, commanding officer of USMC helicopter squadron HMH 462, Santee’s adopted Marine unit at Miramar MCAS. Not quite as big as the July 4th celebration, but still a lot of fun, was the All-American Burger Challenge put on by the Pathways Community Church for the high school youth group. 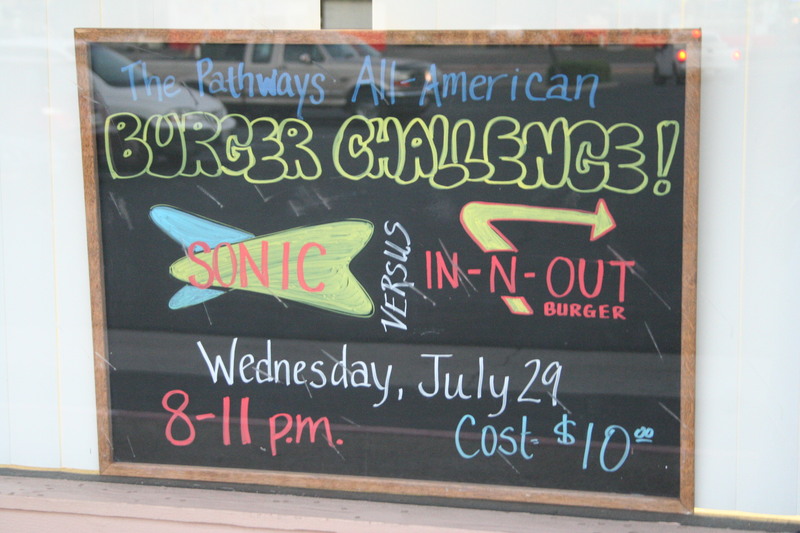 This little escapade pitted Sonic against In-N-Out to see who had the best burgers around. The group hit Sonic first, each person sharing a regular Sonic Burger and tater-tots with a partner. Then everyone headed over to In-N-Out for shared orders of a burger and fries. Of course at both locations each person got his/her own drink. The final results? In-N-Out for hamburgers, Sonic for drinks, and In-N-Out as the overall winner. Also during July I started previewing The Week Ahead, covered the July Chamber Mixer, promoted the Fashion Rocks the East fundraiser for the Miss Santee Pageant, and reviewed concerts by Southbound Jonny, Spectrum, and Cash’d Out. August started out with an interview with Miss Santee, Sierra Billock, and the announcement that Santee Lakes had, indeed, been named San Diego’s Best Campground. Other posts included Summer Concert reviews of the Screamin’ Primas, Emerald River, and Bayou Brothers, the grand opening of Santee Family Optometry, and federal stimulus projects on Magnolia Ave. and Mission Gorge Rd. One important event was the annual National Night Out hosted by the San Diego Sheriff’s Department and held at Woodglen Vista Park. The event is a nation-wide anti-crime activity that has a goal of getting communities involved. The Santee Night Out included music, food, games, and fun for all ages. But there was a serious side as well, with information booths on safety, members of the Search and Rescue team with their dogs, a demonstration by the Sheriff’s K-9 unit, and a Domestic Violence Victims Display. A second important event in August was the Fashion Rocks the East fundraiser for the Miss Santee and Miss La Mesa Pageants. 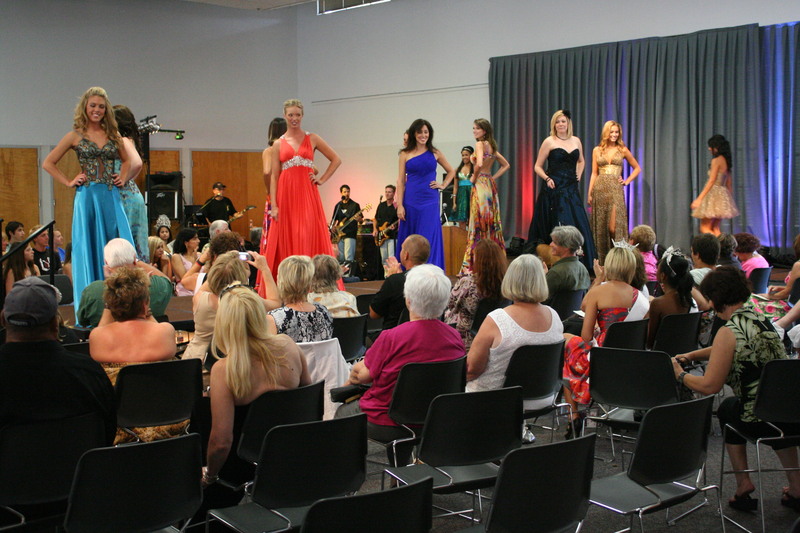 The fashion show was held in the Arbor Room at the La Mesa Community Services complex, and included current and former Miss Santees and Miss La Mesas and recent runners-up. The event was spearheaded by Santee’s own Sierra Billock, who felt that the women who benefitted from the pageants should do their part to help support future participants. Because of some personal issues, I didn’t get back to blogging until late in September. The only posts for the month were on the work on Mission Gorge Rd., a message on Fire Preparedness from Supervisor Greg Cox, and plans for a fundraiser to support the Mother Goose Parade. The last review post will cover October through December. When it comes to celebrations, Santee knows how to do it right, especially on the Fourth of July. Last Saturday was the annual Santee Salutes July 4th Celebration, held at the Town Center Ball Fields next to Rio Seco School on Cuyamaca St. The fun kicked off at 3:30 pm and continued until the fireworks ended well after 9:00 pm, and included rides, games, food, and music. Santee’s adopted USMC unit from Miramar, HMH 462, the Heavy Haulers, provided the Color Guard for the ceremonies; Lt. Colonel Ronnie Carson, commanding officer of HMH 462, was the keynote speaker, guest of honor, and honorary mayor for the day. A big “Thank You” goes out not only to the City of Santee, but also to the event’s major sponsors, Waste Management and RCP Block and Brick. In addition to these companies, several local businesses helped out, setting up booths or selling food in conjunction with community groups. This was truly a community event, at all levels. Before the main ceremonies, the crowd was entertained by a group calling itself “Bootylicious,” playing music of the 70s. What was probably the highlight of their performance was a rollicking rendition of YMCA. Interestingly, aside from their afros, platforms, and 70s outfits, they bore a striking resemblance to the musical headliners, 80z All Stars (insert nod and wink here). Mayor Randy Voepel began the opening ceremonies and introduced the guests, including Lt. Col. Carson, Councilmember Brian Jones, Miss Santee, Miss Santee Teen, Miss Santee Runners-Up and Princesses, and special singers. After the presentation of the colors, eight-year-old Natalie Sako sang the National Anthem, followed by Brittany Siler and Madeline Cepeda singing “America the Beautiful.” Even though she is only eight, Natalie has a voice that could easily come out of someone three times her age. Brittany and Madeline performed a great harmony duet, although they did have a tough spot, following Natalie. After the songs, Lt. Col. Carson spoke, followed again by Mayor Voepel, and finally Miss Santee, Sierra Billock, and Miss Santee Teen, Nicole Ehlke, gave a rundown of the activities for the day. Following the ceremonies, the 80z All Stars took the stage to entertain until 9:00 pm. This high-energy group is always a hit at Santee events, including this year’s Street Fair and the Santee Summer Concert Series. Featuring lead singer Nigel Naughty, guitarist Motley Who, bassist Devo 2.0, and drummer Karate Kid, the group kept people hopping and dancing all through the evening. As with any good July 4th celebration, the night ended with a literal bang as fireworks lit up the sky and patriotic music filled the air. The approximately 20-minute show seemed to satisfy everyone, eliciting multiple “oohs” and “ahhs” from the crowd. I will have more pictures up soon.